The same technology like this Speak & Spell was used in two other products: Speak & Read and Speak & Math. View the more serious Language products like the Language Tutor. 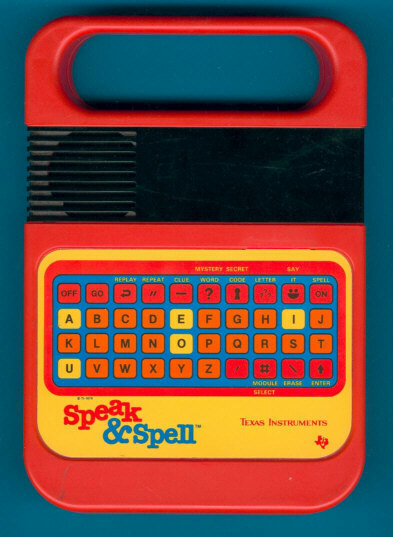 For the United Kingdom market Texas Instruments just changed the Speech-ROM's and created the Speak & Spell (English Voice), while Radio Shack sold the product as Spellmaster. Later in 1989 the Super Speak & Spell was introduced with a multiline LC-display. Another two years later marketing decided to switch back to the original housing. View the wonderful Super Speak & Spell (91) and don't miss the wonderful "Professor" sold in China. Dont't miss the appearance of the Speak & Spell in the movie „E.T. - The Extra-Terrestrial“. Do you know Qubais Reed Ghazala? Get more tunes from your Speak & Spell with circuit-bending. The Speak & Spell is featured in the Texas Instruments Incorporated leaflet Follow the Learning Path™ dated 1991.